The photos above are of Cape Ann MA's Ladies Night shopping among the festivities. It was a lovely night and enjoyed rambling around enjoying the lights and taking photos. Then it was time to meet the 'ladies' for dinner. The place was so loud and noisy we could barely 'chat' much less relax. Could have been the acoustics of the place; yet have you ever been in a room filled with only females? Nuff said? Sorry, ladies, I love you all but I was glad to get back out in the fresh night air. Come to find out; everyone felt the same way. Yet, they stayed. I just had to leave my mind and body was (V) vexated (for ABC Wednesday) by the negative energy. Otherwise I would have needed a good dosage ((D) for Alpahbe Thursday) of medicinal liquor (none of which, does my body like). ^_^ So what other words can I come up with for ABC and Alphabe ~ hmm ~ Vendors selling to shoppers, Dear ones looking Xmas presents, more words, decorations, divine light of season, very, vain, voices and on and on for Ladies Nite on Cape Ann MA. Guess you had to be there? We hope you enjoyed our post for creative photos and self expression through photography and haiku and will check out the other creative bloggers listed above. 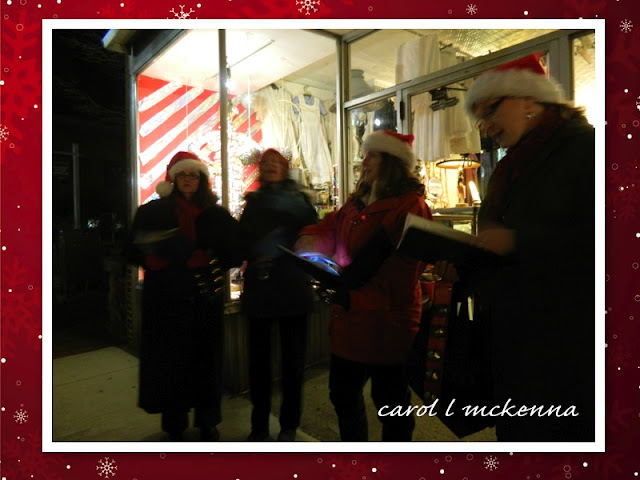 Ladies night shopping and caroling, sounds like fun to me! Your photos are beautiful and I love your cute haikus! Have a great week ahead. Christmas is such a fun time. 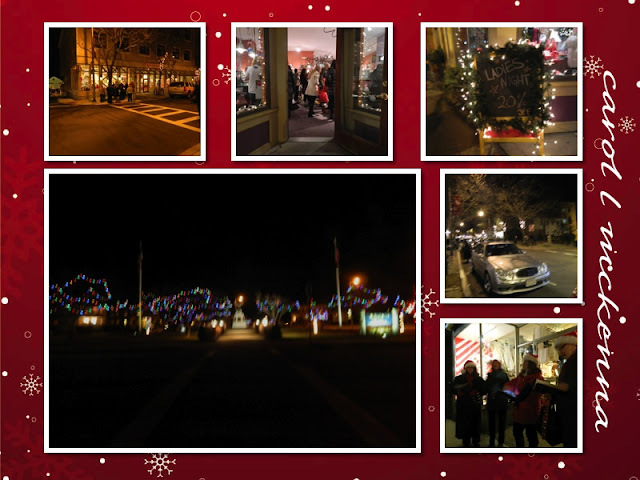 I just love wandering around the town looking at the decorated windows and the lights. Everyone seemed to be having fun in your pictures too. Great photos, loved the New Year haiku. Wonderful Pics,looked like an exciting night! 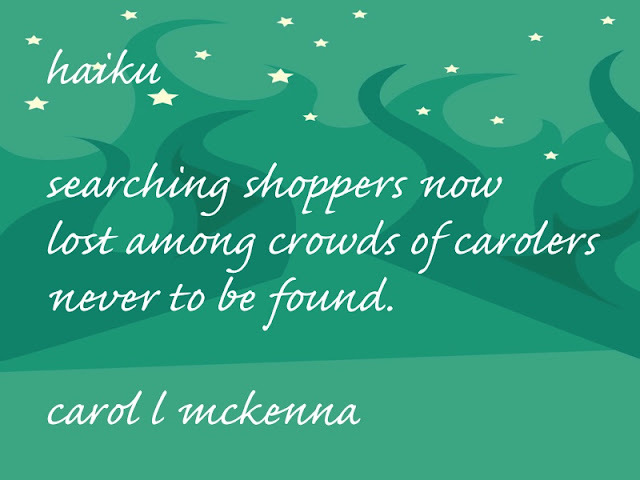 Your "search" haiku is so funny! Poor lost shoppers! Choosing what comes is such hard work! looks fun. i can't wait for Xmas. i just love the festive atmosphere. Nice pictures you show - wonderful Christmas atmosphere. Wish you a good Tuesday. How lovely! I'm one of those poor lost shoppers - haven't even started yet! Love the festive atmosphere here :) Wonderful post! Beautiful post, Carol, both haiku and photos! Lovely pics ... have a great day !!! You are hilarious describing the clucking hens!! I don't blame you...it did look fun though. How lovely, and your haiku are awesome. Your haiku sat on beautiful background as they are deserved, and your photos are gorgeous! You must be tired after all that retail therapy. Shopping and caroling sounds like fun but I find that I get overheated and headachey after being in the shops too long. That VEXES me! lol Sounds like you had a great time! 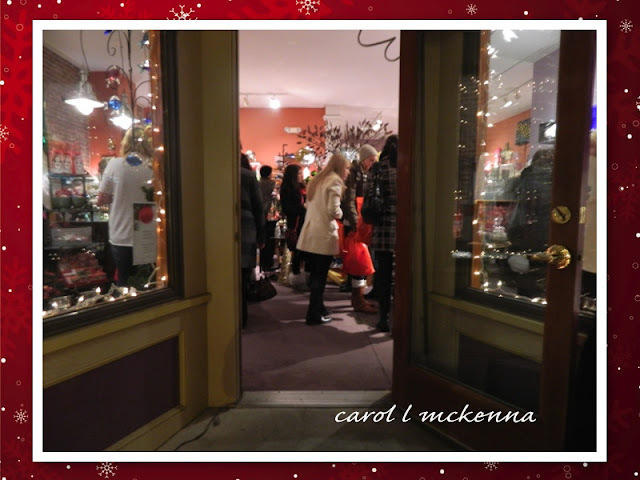 Wonderful Christmas-time captures Carole ... Your borders are gorgeous. I've been VEXED by shoppers myself. But being lost in a group of carolers isn't the worst thing! Carolling is something that i miss too, done that decades ago when i was still young! sounds like a fun place to shop and not too crowded or busy...very pretty shots ...have a wonderful holiday season. Fantastic festive mood in these! Great shots! Wowza, an all women night - can't imagine! Lol. Looks like you all had a fun night, good for you!! All of your photos tell me eloquently merry festive mood of Ladies Night for Xmas Shopping. I wish I were one of them!! Lovely Haiku. Shoktong, according to those who drink it, is medicinal liquor. Both of them lovely, Carol, the former getting lost while shopping - never to be found - and the later so romantic in the old style, well done! Great photos! I love this time of year when the shops are decorated for the holidays. And 20% off for the ladies - very nice. I smiled when I read that the restaurant full of females was loud. :)) It IS true, sorry to admit. 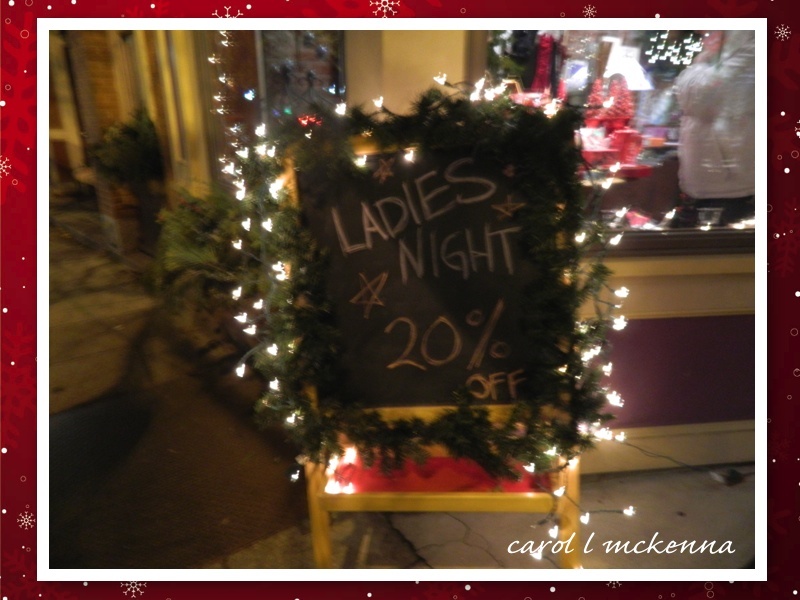 Ladies Night Out in our town is fun -- once a year is about all one can/should take! Great *D* post – as always! Hi again! Love the shots – a good time was truly had by all! Thanks for stopping by. Have a great weekend and look forward to *seeing* you again! 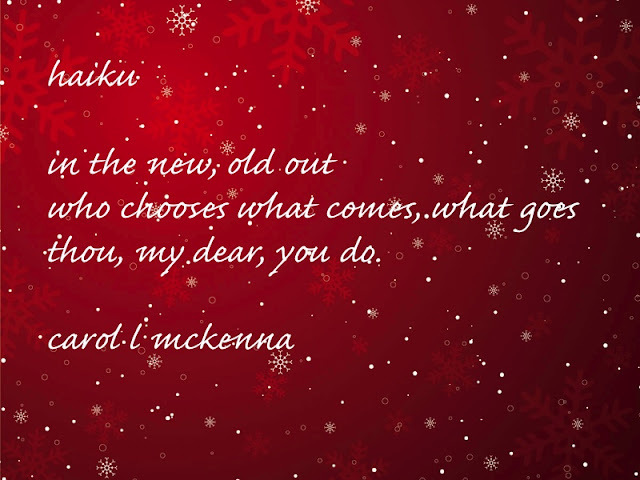 Loved the red background of the haiku ! Good shopping pictures, Carol. :) I went shopping with Mrs. Jim yesterday too. And got a few good pictures. I wanted a lot of skaters on the ice rink in the Galleria Mall (inside) ice skating rink when I took the picture of the four story Texas pine Chirstmas tree but there were only two out on the ice. The best part of our shopping was the United Airlines VIP Lounge. We has coffee, cookies, brownies, Diet Cokes, fruit, and WiFi provided for the airline crdedit card holders. Plus four passes to the VIP lounge in exchange for the two toys we brought. what fun! shopping & caroling! great pics & haiku! Great pics, Carol! The festive season is well up in arms! Everyone in the thick of things! we never see carolers anymore. i loved being one as a child. 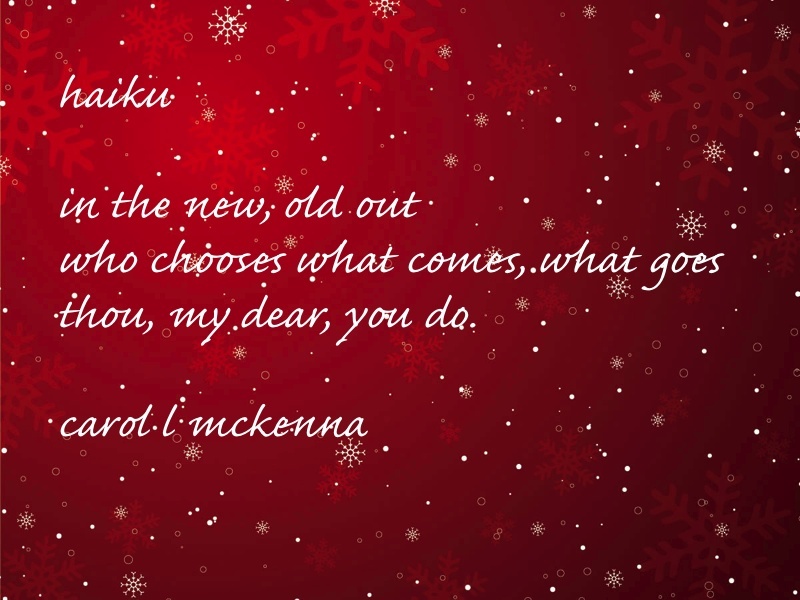 Festive photos and thoughtful haiku...a winning combination! I feel so much stress in your words. Sometimes my imagination is a bit overactive! I hope you're okay though. And thank you for linking.